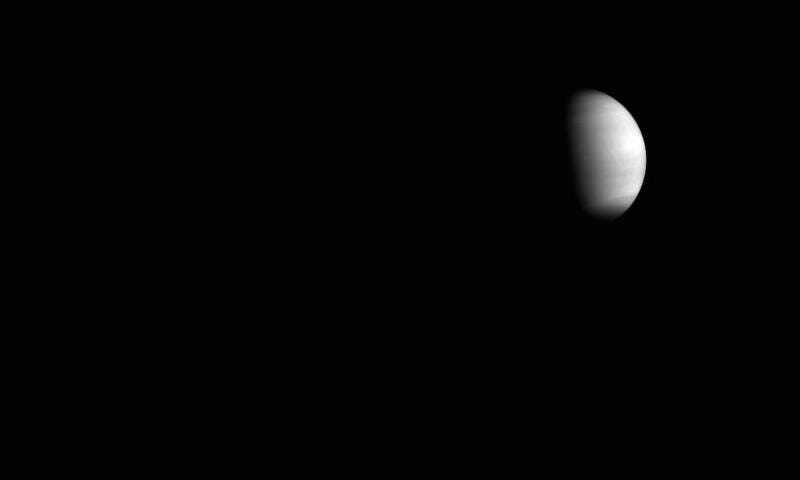 The first images of Venus from its solitary, tardy orbiter are already revealing new secrets about its cloud dynamics. The fourth of the Akatsuki spacecraft’s cameras sent back new details on cloud structure for the planet’s roiling storms that we’ve never seen before. Akatsuki is the plucky spacecraft that managed to use its manoeuvring thrusters to slip into Venus’ orbit five years late. It looks like its instruments survived its close brush with the sun, and now the spacecraft is sending back its first up-close pictures of the planet. The first three cameras all booted up quickly and captured images on December 7th as soon as the spacecraft was in orbit. The fourth camera took longer to boot up as the detector needed to be chilled to below -328°F (-200°C). It didn’t capture its first in-orbit image until December 11th. Between the super-rotation of Venus’ clouds and the spacecraft’s orbit, all four images capture approximately the same regions, despite being days apart. The images are in infrared and ultraviolet light, so are remapped to the visible spectrum for us to see them with our limited human eyes. The long infrared (LIR) is used to map out temperature distribution, while ultraviolet (UVI) maps the chemicals involved in cloud formation. The two other mid-infrared views capture cloud structure at the upper layers and deeper within the clouds. The IR2 infrared camera is centered around a strong absorption band for carbon dioxide. This can be used as a proxy for measuring the undulations of the cloud tops, revealing highs and lows. We already knew about the broad band around the planet—cloud tops at the north and south poles are lower (darker in the IR2 image) than in the central latitudes. But this image is the first time we’re seeing the more delicate structures of striping within the low latitude regions, giving us our first hint at unravelling the complex cloud dynamics of Venus. We have no idea what it means yet, but at least we’re finally getting fresh details for this painfully-understudied planet to start pointing us in the right direction to ask questions.